When you switch to a powered shaver, it may take two or more weeks for your skin to adjust and feel like you’re getting a close shave. When you open your Wahl shaver package, charge your shaver for 1 hour before the first shave. Thoroughly cleanse and completely dry your skin prior to shaving. For maximum speed and efficiency, hold the shaver so that both foils are in contact with the skin. 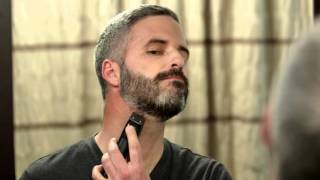 When shaving the upper lip or neck, hold the shaver so that the uppermost screen is in contact with the skin. Don’t press foil heads hard against the face. Heavy scrubbing action with the shaver could damage the foil and will not result in a closer shave. The best way to shave is to primarily shave against the grain of the beard. But also shave in the other direction for a thorough, close shave. Stretch the skin taut in the path of the shaver. Be sure to clean the shaver, cutter bars and foil after every three or four shaves.